One of the first bills from Com-ed. It shows we produced 967 KwHours in July and only used 11. NICE SURPLUS! 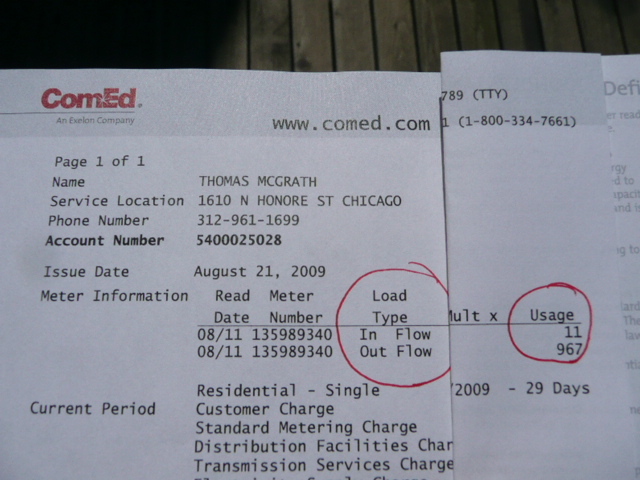 So- what’s the deal with Net-metering? In Illinois, we buy at 10 cents/KwH and sell at 10 cents/KwH. Also, if you produce more than you use, you don’t get a check back from Com-Ed. All you get is to roll the balance forward. At the end of a year, if you have a credit the slate gets wiped clean and you start all over from scratch. Also, you pay about $10/month for ‘distribution’ (even though most of my power is generated on site and doesn’t need to be distributed). So the bottom-line is that in Illinois, you can’t make money on your investment, and it’s really difficult to even break even on it. Given the fact that we currently have much more demand than supply for renewable energy, it’s sad that things are so stacked in the utility-company’s favor. What can you do? The financial deal is simply legislative. Some states like Wisconsin have progressive policies where you buy at 10 cents but sell at retail rates (currently 25-30 cents). Countries like Germany and Greece are even more progressive (Greece recently passed law requiring the sell price be set at 55 cents/KwH). You can become active in the cause by writing your state legislators and asking them to support FIT/REP (Feed In Tariffs/Renewable Energy Payments) legislation. More information can be found at the Alliance for Renewable Energy. You are currently browsing the Elementalbuilding blog archives for August, 2009.